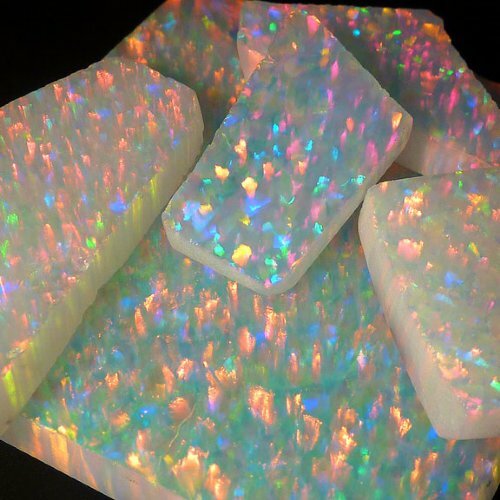 I recently stumbled on a shop called Profound Glass that makes lab created opals. They have some absolutely beautiful work - I enjoyed perusing their webpage and thought I'd share one of their creations with you first so you can see how beautiful it is when whole. 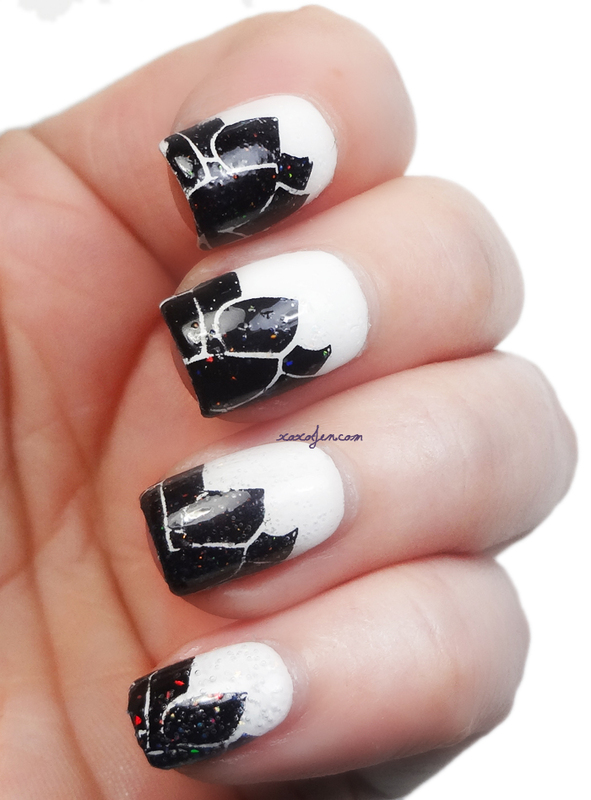 I wanted to show it over both black and white polish so I decided to stamp some water lillies from plate VL012 at an angle so that the nail was about half white and half black. 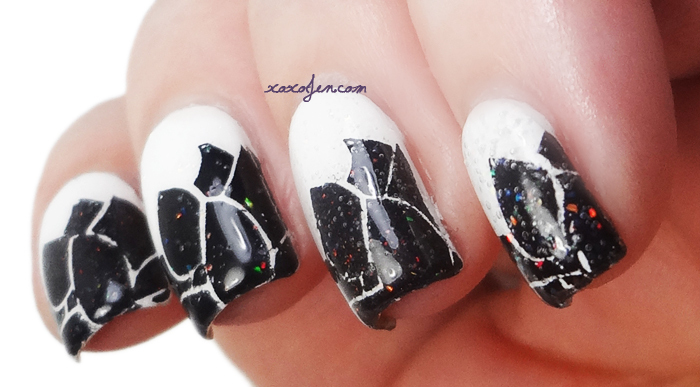 I then layered the crushed opal over my index nail (1 coat) and ring finger (2 coats). I used the prototype on my middle finger (1 coat) and pinky (2 coats). I also took a few close ups and bottle shots for you to see and compare. Indoor lighting doesn't really do these polishes justice, they need sunlight to really show off the fire in the opal pieces. I was able to catch a few in the photos. The sparkle shows over the white part of the nail but its not as noticeable as it is over black and nearly impossible to see in the photos. I used extra top coat over the ring and pinky finger, and unfortunately the topcoat bubbled because I put it on too thick. woops! 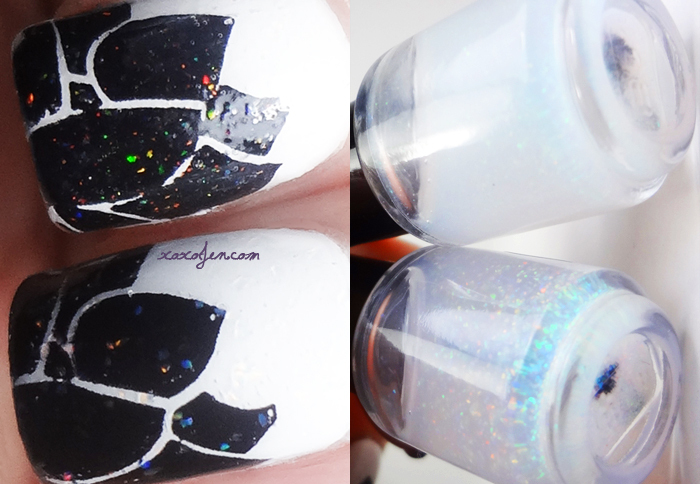 In the photo above, the original crushed opal polish is on the top and the prototype is on the bottom. Even though the prototype's shards are more noticeable on the nail, I prefer the original crushed opal polish to the prototype. The larger opal pieces in the prototype tend to sink in the base and require more layers of top coat to smooth. The original crushed opal polish is available in both mini and full sized bottles at the Profound Glass online shop. The prototype is still in the testing stages and Nate hasn't determined whether it will be launched. Which one do you think you would like best? This is really interesting and the effect is very pretty! I'm SO glad you swatched this! I've been debating pulling the trigger on this for awhile, and it's So pretty! My main concern was the crushed opal scratching my nail beds on removal, did you notice any damage or are all my concerns for nothing? :D I use a peel off base (yellow stopper - link in sidebar), so I can't speak to removal; however, to the touch it feels less rough than a zoya texture polish - if that helps. Its more like a teeeeny microglitter and only took one coat of top coat to feel smooth. The proto has larger shards and took a layer of gelous, and two coats of seche vite to smooth it out.